They say you don’t need to actually watch a roller derby match – which is what we’re calling them now in protest at WFTDA changing the official term from bout to game – to know how tough and hard hitting it was. You can find that out just from the state of the players’ shoulders at the final whistle. Ideally, of course, you’ll need a copy of the chart created by Roman physician Ignius Solarus in around 110 AD. It was used to quickly assess sunburn levels – in order to most effectively distribute available ointment – of soldiers/legions marching long distances in the Roman Empire’s Middle Eastern extremities. Whilst said ancient chart would need to be adjusted for derby and altered for individual players’ ethnicity, skin tone and lifestyle (from tanned beach bunnies to daylight-averse Goth punks), it would likely go a long way towards telling you who was throwing or receiving the hardest hits, as well as giving you an overall ‘shade’ of toughness for the match. Suddenly it makes sense that there are so many roller derby leagues in this part of the world. Enough, indeed, to have set up the UK’s first meaningful year-long tournament. The Heartland Series is now in its third year, including a first under a different name. These towns that the Series grew out of seem almost saturated in derby. Let’s do the maths. The whole of Greater London contains at the last count four senior derby leagues (including a male one that’s largely based outside London anyway), whereas this ‘Heart of England area’ – with less than half of London’s population – contains around twenty women’s leagues, plus a bunch of merby sides too. Towns like Northampton, Bedford, Hertford and here in Milton Keynes are each home to two senior women’s leagues, and some places have three. Heck, it goes to figure. After all, if there’s nowhere to buy a paper on a Sunday, what the hell else are you gonna do but skate? Even the local Mayor has been driven by the lack of comment pieces to read (or crosswords to complete) to attend today’s double header. Disappointingly, he’s not on skates, but he does do the honours of blowing first whistle for the day’s opening match. Divisional favourites Big Bucks High Rollers in green are up against the navy blue clad Norfolk Brawds. Although the latter actually top the table on points going into this contest – these being the two winning sides from the first South East region matchday – the Wycombe side are keen to reassert their ‘top seed’ status, and they score 27 without reply over the first three jams. The strong El E Copped Her, pacey Agent Sparling and fleet-footed Miss Pain Maple prove a particular handful for the Brawds blockers when starred up for Big Bucks. Defensively, it’s a slow paced positional battle, with the East Anglian jammers struggling to break through the Wycombe walls. Colletteral Damage looks the Brawds’ biggest jamming threat, and the Norfolk league are putting a few points on the board now, but the green machine is very much in control. The harder skating style of the Wycombe league is having an impact on the turn two track tape too. Located in front of the Big Bucks bench, the punishment it takes during line-up swaps is the source of much fraying, wire showing and several reparatory official timeouts. As the first period comes to an end, its 91-25 scoreline eminently bridgeable – if Norfolk can just get their jammers out quicker in the second half – one wonders what kind of tactical track tape the Brawds bench have to hand. Something to repair the frays Big Bucks have caused to their gameplan? With no alcohol on offer in the leisure centre, and the nearest pub – possibly the only pub, if they’re anything like Sunday newspapers round here – six minutes walk away, we resort to wandering the centre’s corridors. During the course of this, we discover what looks like a brilliant new sport. There’s a table tennis table in the middle of a squash court. Table squash? Brilliant! What sort of ball is used? What different tactics are in play for when it bounces from table to wall and back again? We ask a passing member of staff, who looks at us like we’re mad. “We just store the table there. It’s Sunday, mate.” Back on track, it’s business as usual for the team in green. Sparling, Liddy Savage, Lolly Chunders, Rucking Hostile, Toxic Tinkerbell and others are keeping the Norfolk jammers pegged back, the two-walls of this strong and physically commanding Wycombe side often proving as effective as a three or four-wall. A-Cute Injury bustles through in the star to add to the green machine’s points total, as Big Bucks seek to put behind them the surprisingly small margin by which they edged past Hell’s Belles in the last round (223-211) and start racking up differentials more worthy of the Division’s highest ranked team. Largely sailing into the wind throughout, Norfolk’s jammers are nonetheless pulling hard and tacking points here and there. There are some valiant starclad showings from players like Philthy Delphia, Penny Slain and Yours Truly. The last-named has been carving out a sideline as a derby announcer (we caught her debut in that role in a greenhouse 40 miles North of here last summer) and is now widely known for sporting the most flamboyant hairpieces in UK derby; sadly this skill is not displayable where a helmet is required. Philthy, meanwhile, is also proving an important part of many Brawds packs, saddling up alongside Cruel Runnings, NoTorious, Teki Bomb, Slammin Siren and others to try and hold back the green wave. It’s a battling performance from the East Anglians. Ultimately, though, the High Rollers (playing in their own county, albeit at the opposite end of it) are good value for the 100-odd places above Norfolk they stand in the European rankings, and they extend their lead to a final score of 213-46. Whilst this is a setback for the battling Brawds, it’s also a shot across the bows for the Bedfordshire side the Norwich fleet defeated 234-111 in their previous South East Division outing. What potential differential might that side face when they line up against Big Bucks in July, and how can they best prepare? The Bedford crew may not be taking part today, but they’re surely watching; some in person, some on Twitter, some when updated at their next training session by those in the former categories. This is the Heartland Series, after all, and almost everyone involved in it is watching out for upcoming opponents and other team’s results, even though most will pretend they aren’t. This year sees the most ambitious Heartland Series to date. Indeed, the most ambitious multi-location tournament in UK derby history. There are 24 teams separated over four divisions, and 22 of those have already played a match in this year’s Series. Several have already played twice. 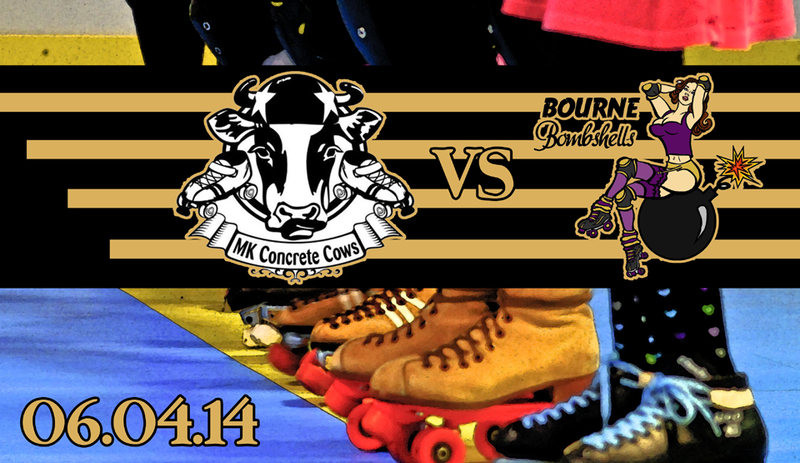 Today’s hometowners Milton Keynes Concrete Cows and opponents Bourne Bombshells are the final leagues making their 2014 Series debut. That’s where the similarities end, though, as MK were heavily involved in setting this tournament up, won it in its first year (when it was called the End of the World Series) and remain at the heart of the Heartland organisation. For the Bombshells, this is their very first appearance in the tournament. Whilst most of the other leagues taking part know each other well – and not just from Heartland – this is a world of new for the Sussex squad. A quick glance at the map goes a long way towards explaining why. Although this is the South East Division, that compass point is largely in terms of the Midlands. The Bombshells are the only team from South of the Thames taking part in this group, and whilst Norfolk are equally removed geographically, the other four sides are near neighbours. In many ways, this whole Heartland experience could be a (very useful) baptism of fire for the Eastbourne league, and that’s certainly the case with today’s match-up. The opening jam – Terrorizinya lining up against Bullet Bomber in the star – is taken 15-0 by MK, with the Bombshells at one point having a full sin bin and a sense of relief that this is the first Heartland matchday played under the 30 second penalties rule. This is a sign of things to come, as a series of insanely well marshalled MK packs (their solidity worthy of the Concrete in the team name) keep the Sussex jammers pegged back. The Cows starheads have time for a pass or two before their opposite number breaks through and forces the call. A pattern is being set, and in what feels like no time MK are 48-2 up with the Sussex points both being last gasp singles on the whistle. A few jams later the Bombshells bench coach, Sassy McAwesome, calls a team timeout. Opposite number OzymAndyAs, possibly the calmest and certainly the most sensibly dressed bench manager in the whole of UK derby, can afford a wry smile. Milton Keynes are very much in control here. Generally speaking, this game is being played at a somewhat faster pace than the previous one. Whether that’s through Eastbourne looking to disrupt the MK packs to give their speedy jammers more of a chance to break through, or the Cows being happy to adapt to any pace if it means the Bombshells tiring earlier, who knows? Certainly, the home side are often happy to let lone blockers such as The Valkyrie (super quick of both foot and mind) keep the Sussex starhead pegged back as the rest of the pack bridge or aid their jammer. It takes the aforementioned being sent to the box, with Bombshells jammer Drag ‘N’ Fly drawing the penalty, for the Sussex league to get some better points on the board. The juking runs of DNF look Eastbourne’s best hope of scoring in general, as even their most physical jammers Toxic Block Syndrome and Smash’Er Fierce are getting little change from the local defence force. The team in purple and leopard skin are also proving no strangers to the penalty box, and a series of power jams – on top of picking up lead jammer status 80% of the time – sees the Cows stretch their lead still further. The wheels are coming off for Eastbourne; quite literally, as one of Dreaded Shortcake’s decides to head off on its own, and she sits out the rest of the jam on the inner track to re-attach it to her skate/foot. The pounding that the pace and physicality of this match is taking on players’ equipment claims an even bigger scalp a few jams later as one of Chunder Woman’s skates explodes. OK, maybe that’s a slight exaggeration, but the boot and plate are having a trial separation and it looks serious. It will take half an hour of kind help from Swift Customs (the skate store run by local men’s teamer Swiftyfool) and a bag of bits to get them back on speaking terms. As Chunder’s skate undergoes major surgery, we take a half time stroll around the hall. As is usually the way in derby crowds, roughly 5% of those present are on crutches, with another 10% bandaged in some way (Bombshell Beast Unleashed forming part of the latter, still cheerily waving from the crowd when her name was announced as part of the skate out). As is also often the way in derby crowds, roughly 0.4% of those present are Team England men’s skater and off-duty High Rollers ref Sutton Impact, bedecked in more sponsored clothing than the average F1 racing driver. We’ve long since stopped keeping track of the scoreline in our notebook, by the way, but the screen in the corner tells us MK are winning 156-37. I guess if you’re gonna make your debut in the Heartland Series (the closest thing to a national league in the UK) you might as well make it as hard as possible by (a) being away, (b) being away to the guys who invented the Series and won it the first year, and (c) having several of your key players’ skates shed parts mid-jam! The second half goes much the way of the first, although the points hauls are lower on both sides. The MK jammers prove resistant to most of the hits thrown at them, although a few solid blows from Smash’Er in particular take ’em down. A very long official review (called for by The Valkyrie) confirms a jam’s end star pass from Philosofear to DNF was in fact legal, and gives the crowd a four minute ‘singing and swinging along to the music’ break. Whilst Bullet is finding it tough to break through the MK packs, especially where Knox is involved, she’s so fast when through that she forces a number of early calls from her opposite numbers. Philosofear picks up a good PJ-assisted 15-pointer as Bullet holds up and Smash’Er fells penalty box releasee Valkyrie. Ultimately though, Terrorizinya, Huni, Beanz and Nucky rack up the points to lengthen MK’s lead and take the differential over 200 on the final jam. The match ends 265-59 to the home team. We dropped by the after party venue earlier in the day, where we were excited to see signs everywhere advertising two Jägerbombs for a fiver, then slightly less excited to be told: “We don’t have any Jägermeister, we haven’t had any for weeks”. Less an offer, then, more of a taunt. This slightly odd venue, with huge windows proudly overlooking a roundabout, fills up after the event – although, as it’s a school night and two of today’s teams hail from over 100 miles away, few but the hometown side and a smattering of Big Bucks will stay for long. The home side give The Philosofear the Best Blocker award, with Bullet Bomber picking up Best Jammer and Smash’Er Fierce as MVP. Chunder Woman’s skate plate traumas merit a special Triumph Through Adversity certificate, and Toxic is given a Leader of the Pack title that she presumes is code for ‘Loudest Shouter’. The Eastbourne league vote Magic Beanz the best opposing jammer, Betty Knox best blocker and The Valkyrie MVP, with their special certificates going to Bolshevik (for Sportsmanship) and Big Bucks’ Miss Pain as Fairy Skate Mother. 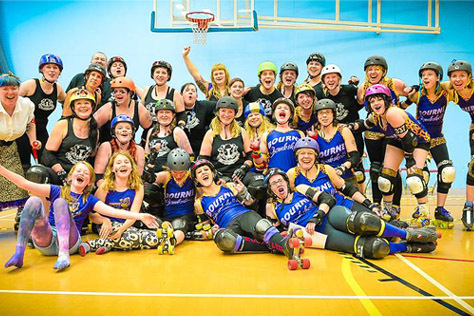 The High Rollers’ own Blocker, Jammer and MVP winners are Lolly Chunders, Agent Sparling and Toxic Tinkerbell, with NoTorious, Philthy Delphia and Teki Bomb picking up the respective awards for Norfolk. 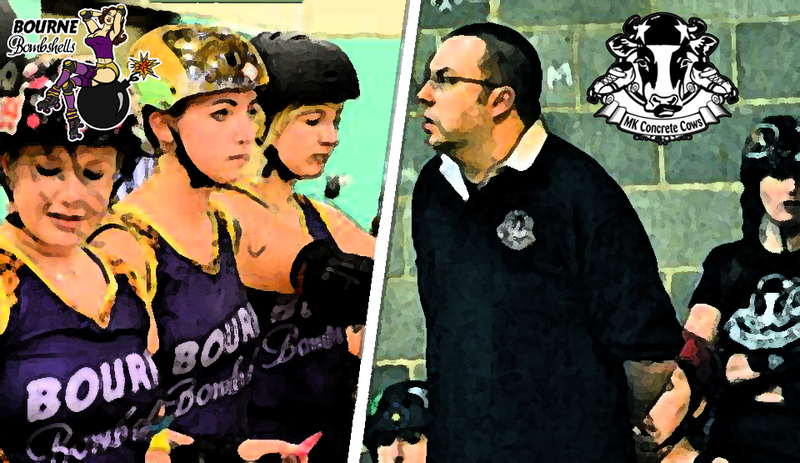 Two of today’s teams are back in action on Saturday 7th June when the mighty Bourne Bombshells host the next Heartland Series South East Division double header at the Dolphin in Haywards Heath. 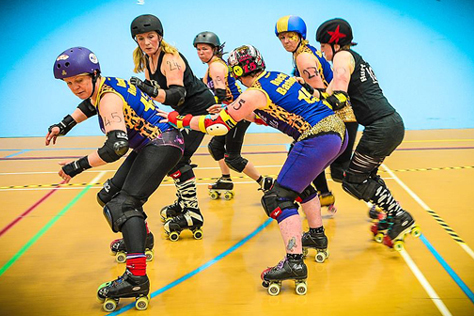 Milton Keynes will be taking on Bedfordshire Rollergirls, and the Bombshells face Hertfordshire’s Hell’s Belles. Doors are at 2pm and tickets are on sale now at £8 each for adults (free for under 12s) or six for £40. The Bombshells have a lot to work on in response to their opening match of the campaign, and with two months to do it in they’ll be coming out tougher and stronger than ever… be scared Hell’s Belles, be very scared. MK Cows, meanwhile, will be hunting the win over Beds that would see them take over top spot in the table from Big Bucks. With three of these four leagues still looking for their first win in the 2014 Heartland Series, and a load more matches to come between now and November’s play-off finals, there’s everything to play for and a thrilling afternoon of roller derby for Sussex to look forward to. Go buy all the tickets now, yeah. 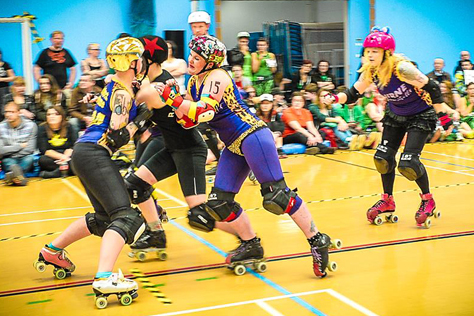 The Bombshells kick off their 2014 gaming season – we’re supposed to call them games not bouts now, WFTDA says so – in style this Sunday (6th April) with a trip up to what we’re calling the South Midlands. Another name for this part of Britain is the Heartland, so it’s a fitting locale for the Eastbourne league to begin their first Heartland Series campaign. The competition sees 24 teams split into four regional groups. The six teams in each group (Eastbourne are in the South East Division) play the other five teams once each at (more or less) monthly double/triple header events, with the top two sides in the final divisional tables going through to an overall finals weekend at the end of the year. 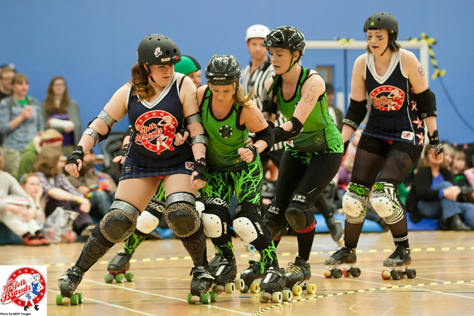 Milton Keynes – or more specifically Bletchley, a town the MK New Town was built a couple of miles north of – is the destination as the Bombshells take on the hosts, Milton Keynes Roller Derby’s A-team Concrete Cows. The double-header’s other bout/game sees divisional favourites Big Bucks High Rollers up against the Norfolk Brawds. Bletchley Leisure Centre is the location, with doors at 2pm and bouts starting at 2.30pm (Big Bucks v Brawds) and 4.30pm (MK Cows v Bombshells). Tickets on the door are £10 adults and £3 under-12s, but adult tickets are a couple of quid cheaper including the service fee if bought online – see the link at the bottom of this piece. The venue has parking and those driving up from Sussex can expect a journey time of two to three hours each way. Public transport-wise, the leisure centre is ten minutes walk from Bletchley train station. Trains leave from Euston, although you can bypass central London by changing at Clapham and Watford Junctions. Journey time is anywhere from two to four hours depending on where in Sussex you’re starting from. The adult return fare varies between £25 and £50, and Bletchley is within the Network Railcard area so card holders can get a third off these fares. After party location The Enigma Tavern is conveniently situated halfway between the leisure centre and station (about six minutes walk from either). Hi there. Firstly, for anyone who might not be aware of the MKRD league, can you tell us a bit about your history and achievements to date? What’s the derby scene like in your area? 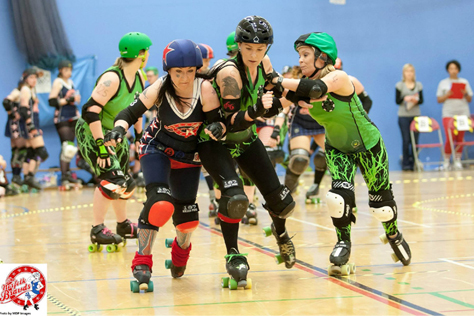 We were formed in May 2010 by skaters who were originally from Bedfordshire Roller Girls, but wanted to set up a team where they lived, alongside BRG. There’s a lot of derby in the area. Bedford has two teams, Northampton has two teams, Oxford now has three and there’s another one in Milton Keynes. We all know each other very well, which makes it a very friendly and competitive area. We hold monthly mixed scrims (on the first Friday of every month) where a lot of us get together. We would love to see some Bombshells there! Our first bout was a closed door against Romsey Town in November 2010 and our first public bout was against the Seaside Sirens in September 2011. We hatched the idea of wanting to play teams more competitively, rather than one-offs, so we launched the End Of The World Series in 2012, a year long tournament with our local friendly leagues. It was a great success (even better as we won the tournament in 2012!) and it grew into the Heartland Series, which had 12 leagues last year and 24 this year. And now we get to play the Bombshells as a result, so it’s pretty awesome! What do you like about the Heartland Series, and what have been your highlights so far? How do you think this year’s – much bigger – series will go? We love the Series as it gives a structure for the year, organisation for our officials and a real focus for training and development. It has meant that we’ve formed really close relationships with a lot of the leagues involved and we’ve made many friends as a result. It’s also great to see teams repeatedly and watch them grow. A highlight for us was winning the first Series. As Bench Manager, I was able to call a timeout right before the last jam of the last bout, just to get the team to appreciate the moment and their unity as a team. Very lucky to be able to do that. We’ve also seen great matches from other teams. Oxford vs Wiltshire from last year was nail-biting, right down to the last seconds. Mean Valley’s games vs Hell’s Belles and the Brawds from last year were real seesaw battles and the Finals Day was an incredible atmosphere, with three excellent tense games and a worthy champion in Severn Roller Torrent. We’re hearing extremely exciting things about the continued growth of the Series into 2015. The most important thing is for all the new teams to have a positive experience and spread the word, and so far the performances of the North West Division teams, Nottingham Roller Girls in the North East and Dorset Roller Girls in the South West shows the strength in depth across the country. It’s great to see all the new teams have fun and improve! Who do you think are the teams to look out for in the South East Division? Did the Bout Day 1 results (Brawds beating Beds by over 100, Big Bucks edging past Hell’s Belles) go as you expected? Big Bucks are the favourites I think, but Hell’s Belles played exceptionally well and were unlucky not to pull off a victory. The Belles have a lot of good skaters and being coached by Reaper [from men’s Team England] could make them a force to be reckoned with this year. The Brawds were awfully unlucky not to make it to the finals day last year. They’re well organized and have strength throughout the team. We look at other team’s performances and results, but essentially we try to focus on what we can control. If we win all our games, it’s in our own hands. What do you know of the Bourne Bombshells (individually and as a team)? We don’t know a great deal. We haven’t made it down to Eastbourne Extreme yet, but we know it’s a great event. We’ve met some Bombshells skaters at mixed scrims and bootcamps, and we’re excited to play them. The great thing about the Heartland Series is meeting new teams and skaters. Are there any particular MK players or tactics people should keep any eye out for? Would you like to predict the result? Our tactic is to be awesome – hopefully it works out! We like to think we have strength throughout the team, and we get a good rotation of our best jammers and blockers. In terms of the result, who knows? As long as derby is the winner! The day’s other match-up sees Big Bucks take on the Norfolk Brawds. How are you expecting that to go, and any players in those teams people should look out for? We’re really excited to see that bout, especially as the Mayor of Milton Keynes is blowing the first whistle! I think it’ll be a really close game. The Brawds will be encouraged by the performance of Hell’s Belles in the first game, while Big Bucks will be wanting to show more of what they’re about. I think it will be a real cracker! Agent Sparling is a jammer to watch for Big Bucks, while Colletteral Damage always impresses for the Brawds. Finally, for those travelling up from Sussex, what can you tell us about your venue? What can we expect from the after party? Any tips on other things to see or do in the local area? Bletchley Leisure Centre has lots of parking onsite and a café. There should be plenty of seats in the hall and suicide seats for the daring. There’s no bar but there will be vendor stalls, including skate gear from Swift Customs. (Swifty is one of our men’s team, the Quads of War, and played for Team Wales in the recent Men’s Roller Derby World Cup.) The after party is at the Enigma Tavern, a three minute drive from the leisure centre. They serve food and it’s also next door to a Burger King (we’re all class in MK). We love meeting the skaters afterwards and comparing bruises! I don’t know if there will be much time for people to do anything else after the bout finishes, but if you’re there for the weekend you can check out Bletchley Park to find out how the war was won by the unsung boffins and cryptographers. 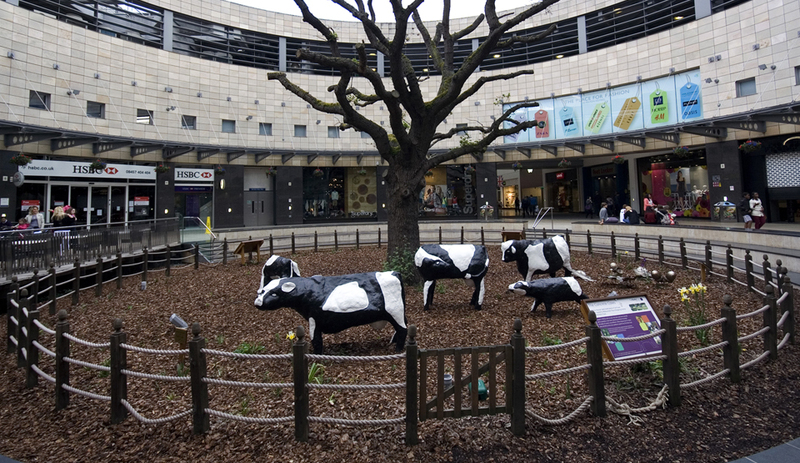 Also XScape for skiing and skydiving, and CentreMK for shopping and being underwhelmed by the original Concrete Cows. You recently took on a mixed league team (Skate Invaders) in Hastings. They were very strong opponents with a number of well known skaters from sides like Brighton and Portsmouth involved. How important was that bout in terms of preparation for the Heartland Series? Going up against the Skate Invaders recently was really exciting. We knew we had a tough challenge ahead of us and wanted to see how far we could push ourselves, ahead of the Heartland Series. It was great to play against such a high level team, and after the match they gave us some critical feedback that we have been working on so as to improve. We learned that we needed to focus on our endurance and play to the best of our ability until the very last second! You’ll be playing at least five Heartland games over the next seven months. Do you have an overall strategy for the Series? 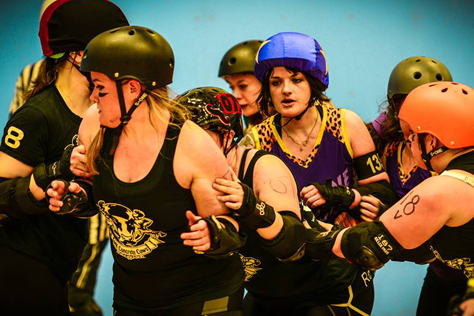 What do you know about the teams you’re up against (Hell’s Belles, Norfolk Brawds, MK Cows, Bedfordshire and Big Bucks)? All the leagues are somewhat a mystery as we haven’t previously played any of them. It was interesting to see that it was such a tight game [in February] between Big Bucks and Hell’s Belles, showing that anything can happen on the day. Statistically we are ranked middle of the range in terms of our region, so we will take every game as it comes. Personally I think Big Bucks will be our toughest competition overall, but we can learn and improve from every game we play in the Series, before we meet them later on in the year. Your Heartland Series kicks off this Sunday 6th April with a trip up to the South Midlands to take on Milton Keynes. Are you looking forward to the game, and how important is being involved in something like Heartland to the Bombshells? Being involved in the Heartland Series has huge importance for the Bombshells and we are really proud of ourselves with how much we have progressed over the last year. It’s great to have reached a standard that allows us to participate in such a well known tournament, which hopefully we can make our mark in. We can’t wait to get started. Yourselves and Milton Keynes are the only Heartland teams (from 24 in total) yet to play. Are there any advantages/disadvantages to starting your campaign after everyone else? Are there any particular MKRD players or tactics you’re going to be keeping an eye on? An advantage of being one of the last two teams to bout is that no one will know what to expect of us. We’ve been keeping an eye on all the other teams bouting for future reference. A few of the Bombshells have scrimmaged with some of the MK girls before, so we do have some idea of the competition. I’ve heard to watch out for Red Hot Chilli Whipper and The Valkyrie. I think some big hits are to be had! Are there are any specific Bombshells players/tactics that people travelling up for the game should watch out for? Would you care to predict the result? We haven’t publicly bouted since November, so the team dynamics have changed… in a good way! We’ve really been focusing on team work, on and off the track (and maybe at the pub). The crowd can expect a new strategy and different line-up tactics. I wouldn’t want to jinx us by predicting a result, but we are ready to put up a fight. The double header’s other game (Big Bucks v Norfolk) will give you an opportunity to check out two of your upcoming opponents. Anything in particular you’ll be looking out for? It will be really good to watch our future competition in action at the double header. We’ll be taking note of their strategies and style of game play to take back with us and work on how we can maximise our skills against them. I’ll be watching out for standout players in both teams too, so I’ll know who to watch out for on the track. Finally, you’re not just focusing on the Heartland Series this year. We understand the Bombshells recently secured a sizeable Sport England grant and have helped set up neighbouring men’s and junior leagues. Also there’s the Eastbourne Extreme tournament coming up in July. How are preparations for that going, and do you have anything else in the pipeline for 2014? The Sport England grant has been absolutely amazing. It will enable us to be a better league and increase our development; for example, being fully equipped for new fresh meat intakes will make trying the sport out more appealing for first-timers. Both the men’s league (Bomb S’Quad) and the juniors (New Bournes) are coming along great. All the Bombshells are really proud of them and love helping out or going to their practices. They will be showcasing their talents at Eastbourne Extreme. The outdoor – and free! – tournament on the 12th and 13th of July is definitely a highlight of the year for us. Preparations are going well and we have some great teams and players joining us. I have no doubt it will be bigger and better than last year. Let’s just hope the sun is out again! All of our efforts will be focused around Heartland and Extreme this year, but if there’s an opportunity to get involved with anything else then I’m sure we will. Some crazy Bombshells are taking part in a 5km Spartan obstacle race later in the year, which looks awfully tough, crawling through mud, etc. I think I’ll stick with my skates!